Josekutty, E. J. Biju, P. Wood, J. R. I. and Augustine, Jomy 2018. Strobilanthes kannanii - a new species of Acanthaceae from the Western Ghats, India. Nordic Journal of Botany, Vol. 36, Issue. 8, p. e01689. Tilney, Patricia M. Nel, Magda and van Wyk, Abraham E. 2018. Foliar secretory structures in Melia azedarach (Meliaceae), a widely cultivated and often invasive tree. New Zealand Journal of Botany, Vol. 56, Issue. 2, p. 198. Wood, John R.I. 2018. 874. SALVIA MACROPHYLLA. Curtis's Botanical Magazine, Vol. 35, Issue. 1, p. 75. Fernando, Edwino S. Quakenbush, J. Peter Lillo, Edgardo P. and Ong, Perry S. 2018. Medinilla theresae (Melastomataceae), a new species from ultramafic soils in the Philippines. PhytoKeys, Vol. 113, Issue. , p. 145. Mabberley's Plant-book is internationally accepted as an essential reference text for anyone studying, growing or writing about plants. With some 26,000 entries, this comprehensive dictionary provides information on every family and genus of seed-bearing plant (including conifers), plus ferns and clubmosses, besides economically important mosses and algae. The book combines taxonomic details and uses with English and other vernacular names found in commerce. The third edition was recognised in the American Botanical Council's annual James A. Duke Excellence in Botanical Literature Award for 2008 and the International Association for Plant Taxonomy's Engler Medal in Silver for 2009. 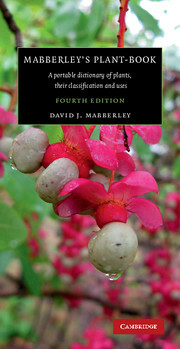 In this new edition, each entry has been updated to take into consideration the most recent literature, notably the greater understanding resulting from molecular analyses; over 1400 additional entries (including ecologically and economically important genera of seaweeds) have been included, ensuring that Mabberley's Plant-book continues to rank among the most practical and authoritative botanical texts available. Backer, C. & Bakhuizen Van denBrink, R.C. (1963–1968). Flora of Java. 3 vols. Noordhoff, Groningen, etc. Bews, J. W. (1925). Plant forms and their evolution in South Africa. Longman, London, etc. Bosser, J. et al. (eds, 1976–). Flore des Mascareignes. Royal Botanic Gardens, Kew; ORSTOM, Paris, etc. Christensen, C. et al. (1906–1965). Index filicum, with four supplements. Hagerup, Copenhagen, etc. Craw, R. C. et al. (1999). Panbiogeography. Tracking the history of life. Oxford University Press, Oxford, New York, etc. Dassanayake, M. D. (ed., 1980–2006). A revised handbook to the flora of Ceylon. 15 vols. Amerind Publishing, New Delhi, etc. Davidson, A. (1995). The Oxford companion to food. Oxford University Press, Oxford etc. Davies, R. & Ollier, S. (1989). Allergy. The facts. Oxford University Press, Oxford etc. Dudareva, N. & Pichersky, E. (2006). Biology of floral scent. Taylor & Francis, London etc. Duke, J.A. & al. (2002). Handbook of medicinal herbs, ed. 2. CRC Press, Boca Raton, Florida, etc. Eggli, U. & Hartmann, H. E. K. (eds, 2001–2005). Illustrated handbook of succulent plants. 6 vols. Springer, Berlin, etc. Engler, A. & al. (eds, 1924). Die Natürlichen Pflanzenfamilien, ed. 2. Engelmann, Leipzig, etc. Fahn, A. (1974). Plant anatomy, ed. 2. Pergamon Press, Oxford, etc. Farr, E., Leussink, J. A. & Stafleu, F. A. (eds, 1979). Index nominum genericorum (plantarum). 3 vols. Bohn, Scheltema & Holkema, Utrecht, etc. Favrettti, R.F. & DeWolf, G.F. (1972). Colonial gardens. Barre Publishers, Barre, Mass. Fernald, M. L. (1950). Gray's manual of botany. ed. 8 (centennial). American Book Co., New York, etc. Hallé, F., Oldeman, R. A. A. & Tomlinson, P. B. (1978). Tropical trees and forests: an architectural analysis. Springer, Berlin, etc. Hirono, I. (ed., 1987). Naturally occurring carcinogens of plant origin. Elsevier, Tokyo etc. Kennett, D.J. & Winterhalder, B. (eds, 2006). Behavioural ecology and the transition to agriculture. University of California Press, Berkeley, etc. Kingdon-Ward, F. (1960). Pilgrimage for plants. Harrap, London etc. Kubitzki, K. (ed., 1990–). The families and genera of vascular plants. Springer, Heidelberg etc. Liberty Hyde Bailey Hortorium (1976). Hortus third. A concise dictionary of plants cultivated in the United States and Canada. Macmillan, New York, etc. Morley, B. D. & Toelken, H. R. (eds, 1983). Flowering plants in Australia. Rigby, Adelaide, etc. Ohwi, J. (1965). Flora of Japan, ed. by Meyer, F.G. & Walker, E.H.. Smithsonian Institution, Washington, D.C.
Organisation for Flora Neotropica (1968–). Flora neotropica. Hafner, New York, etc. Page, R. (1983). The education of a gardener, new ed. Collins, London etc. Plant Resources of South-East Asia [PROSEA] (1989–). Pudoc, Wageningen; etc. Rattauf, R. F. (1970). A handbook of alkaloids and alkaloid-containing plants. Wiley, New York, etc. [Ruskin, F.R.] (ed., 1975). Underexploited tropical plants with promising economic value. National Academy of Sciences, Washington, D.C.
van Steenis, C.G.G.J. (etc., eds, 1948–). Flora malesiana. Noordhoff-Kolff, Jakarta, etc. Sudworth, G. B. (1908). Forest trees of the Pacific slope. US Department of Agriculture, Washington, D.C. Note: Increasingly, the contents of these periodicals are available on the Internet and in many cases, recent journals and recent issues of established ones are only available thus. Boletim do Museu Paraense ‘Emílio Goedi’ New Ser. Byulleten Moskovskogo Obshchestva Ispȳtateleī Prirodȳ. Biol.